This is a postcard showing Fairmount College in Wichita, Kansas. It was a private Congregational school and was founded in 1886 by the Rev. Joseph Homer Parker. Collegiate classes began in 1895. In 1926, by a vote of the citizens of Wichita, the college became a public non-denominational institution named the Municipal University of Wichita; it was the first municipal university west of the Mississippi. After 38 years as a municipal university, it changed its status on July 1, 1964, when it officially entered the state system as Wichita State University. 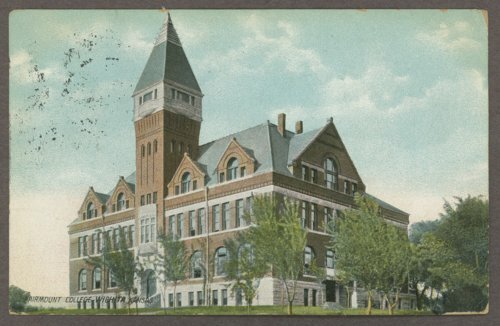 This is a postcard showing Fairmount College in Wichita, Kansas. It was a private Congregational school and was founded in 1886 by the Rev. Joseph Homer Parker. Collegiate classes began in 1895. In 1926, by a vote of the citizens of Wichita, the college became a public non-denominational institution named the Municipal University of Wichita; it was the first municipal university west of the Mississippi. After 38 years as a municipal university, it changed its status on July 1, 1964, when it officially entered the state system as Wichita State University.